It was a banner year for Bacon Poetry. We had nearly forty entries. Some were long. Some were short. Some were funny. Some were sad. But one poem captured the hearts of the Baconfest Literary Panel with its brevity, wit, searing eroticism and smoldering sensuality, which it manages to express with the syntactical economy of a modern-day porcine William Carlos Williams. That poem “Undone” is by our 2019 Baconfest Poet Laureate Kimber Sullivan and it is reproduced, in its entirety, below. Kimber is now the proud owner of a Golden Rasher Award for Best Poem about Bacon and the happy possessor of four VIP tickets to the 2019 Baconfest session of her choice. Congratulations Kimber! Thank you to all of our poets for submitting. It was a difficult job for the Literary Panel to select a winner from so many exemplary options. But they persevered. And we hope you will persevere too! If, by chance, you didn’t win and you would like to attend Baconfest, I have an opportunity to share with you. 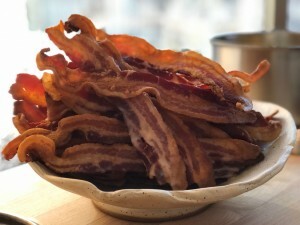 Baconfest tickets are still on sale and you can buy them right now. Hope to see you there on April 5 & 6. Here is a picture of bacon.